W1 = ANNE Farrant’s Will of 1749 (by relationships named in her Will Anne would have to be the daughter of Richard Farrant/Elizabeth Ruminger: However, unable to find her in Parish Register Transcription unless the original entry was illegible or she was baptized elsewhere. 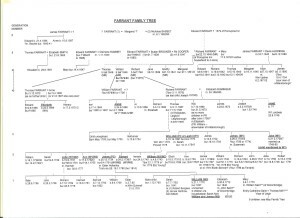 Alternatively, she could be Anne, daughter of William Farrant (wife not known, possibly Anne) – and the relationships given in the Will would in theory be incorrect according to our interpretation of relationships, although they would have still been quite close relatives: but it is not unknown in early generations for relationships to be defined differently than they are today). Colyer Ferguson Parish Register Transcription: as no ages given at death in early registers, it is difficult to determine who is who at burials with so many similar names, hence various dates given. Pre-1752 years in old style, when the new year commenced on Lady Day 25 March: hence double years for months Jan-Mar in these earlier registers. Colyer Ferguson transcription used for majority of above with few later burials from Leigh burial index. There are no Farrant entries in the post 1813 baptism and marriages. 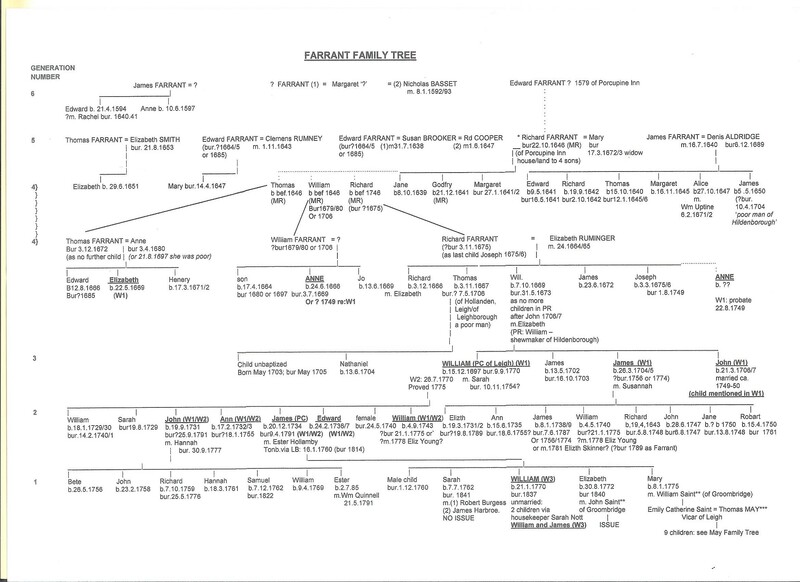 Uncertain line of descent: ………………… ..
Generation 4: the 3 connecting lines are the possible connections to the children of Richard Farrant and Mary (generation 5): however, their baptisms are not found on the Colyer Ferguson transcript: either due to illegibility or they were baptized elsewhere. But there are possible burials in the parish registers.